Pity the poor evergreen, which rarely gets to see the inside of anyone's house except for a few short weeks in December. 1) The easiest and most common way of disposing of an old Christmas tree is simply to haul it outside – cursing the needles accumulating all over your house – and leave it for someone to pick up. Some cities and towns will haul it away to be mulched, some simply throw it out. Being plant material, it’s among the least harmful possible things to dispose of. That said, the tough fibers of an evergreen can take quite awhile to decompose in a landfill. Google your city or town’s preference for how to leave trees on the curb: Most require you remove all decorations and many won’t take a tree if it’s in any sort of bag. 2) But usually, there are better options. Most cities have some kind of mulching facility. Take a look at New York City’s: There are dozens of places to drop off your tree, where it’ll be run through a wood chipper and turned into mulch. At most of these locations, you can even take home some mulch for free – a huge boon in cities where good, clean soil is a rarity. Christmas tree mulch is especially great for helping other trees stay warm through the cold winter. (This is presuming we have a cold winter this year. Or any winter at all? What’s going on with this weather?) If you have a way of turning your tree into chips yourself, by all means, do that. 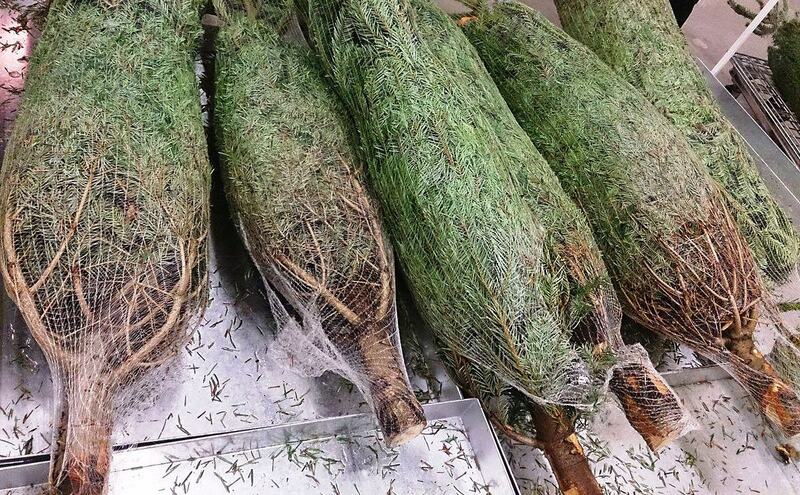 You’ll have fragrant, delightful evergreen chips to play with. 3) There are also private services you can call to come and personally remove a tree, though these can be pretty expensive, usually around $50. 4) Now let’s get into actually reusing your tree. If you have a yard, you can set up an old Christmas tree with some bird feeders and maybe some festive strings of popcorn, and you’ll find yourself with a pretty amazing and enormous bird playhouse. Just remember to remove anything birds or other wildlife can choke on, like tinsel. By the time the winter’s over, the tree will have dried out, and you’ll be able to easily break it apart by hand and throw out in a yard waste bag. 5) Some folks recommend tossing a tree into a pond, where it can provide a habitat for fish and other marine critters. We think this is a cool idea, with some caveats: Make sure your tree hasn’t been treated with any preservatives that can leach into the water, and check with your local authorities so they know you’re a friend of fish and not just chucking your garbage into water. 6) You could also see if your tree is needed anywhere nearby. This may sound vague and confusing, but trees are a natural barrier for erosion, and some places, especially near water, have found a use for them. The Jersey shore was in dire need of any kind of barrier after Hurricane Sandy, and the donations of old trees helped immeasurably. 7) If you have a chainsaw, saw off all the smaller branches of a Christmas tree and you’ll be left with a nicely manageable trunk. This Old House recommends sawing the trunk into two-inch-thick rounds, which can be used to line a garden bed. Or you could slice it even thinner and use the rounds as coasters – you might want to use some polyurethane or other coating to keep the sap from coming out. One thing we can’t recommend doing: Don’t ever chop up the wood from a Christmas tree and light it in your fireplace. Evergreens have high levels of creosote, which is basically tar, and can cause extremely dangerous smoke and buildup.